Comments: The obverse of this coin commands a lot of attention and certainly is an attractively toned coin. There is a little spectrum at about 2 o'clock. But the key to the color cycle is on the reverse at the bottom. This is a well placed coin in our opinion. It has a few abrasions, but not too many for the grade. It also gets some style points with its obverse color. With the VAM 62 there can be confusion with other VAMs because date doubling, doubled legends, and earlobe doubling are not rare. But the one distinguishing mark is the small gouge going diagonally from the d in God. This one is tough for us. The nature of the toning says it came from an album or an advertising piece where the rim was in constant contact with something acidic. The color starts at the rim and is progressing toward the center. But it was removed from contact and the toning stopped short of the center. The reverse is confusing because there is a line of contact, but also down at about 7 o'clock something blocked the contact. 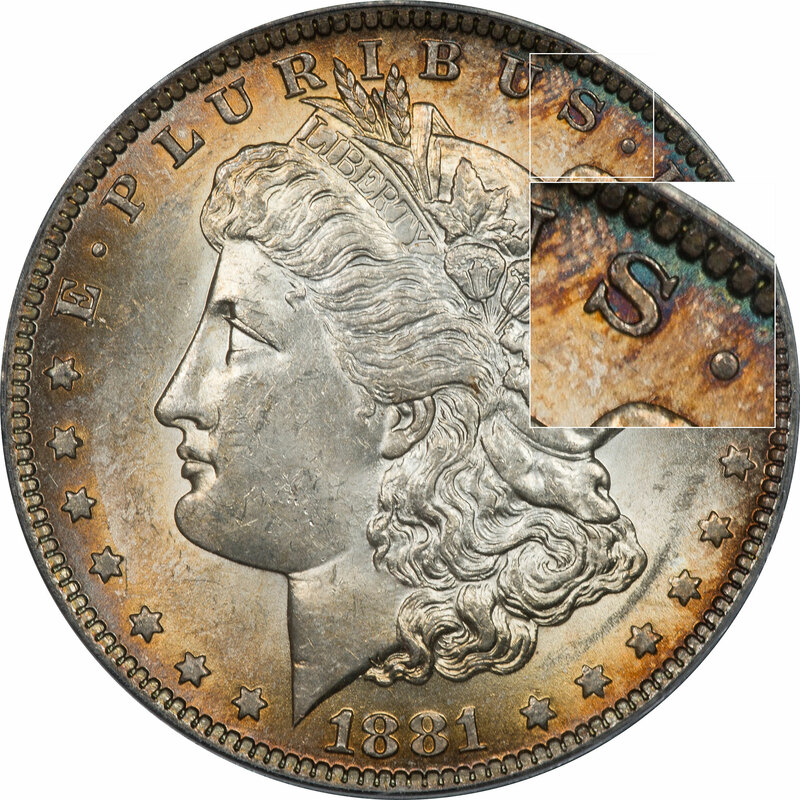 A little of the color from the obverse is starting to bleed over to the reverse, but it is different. Perhaps the difference comes from exposure to light on the obverse. The best view of the color spectrum on this coin is on the reverse because it is lighter in just easier to view. Those colors tend to be toward second cycle with cyan, lemon yellow, magenta, and blue. 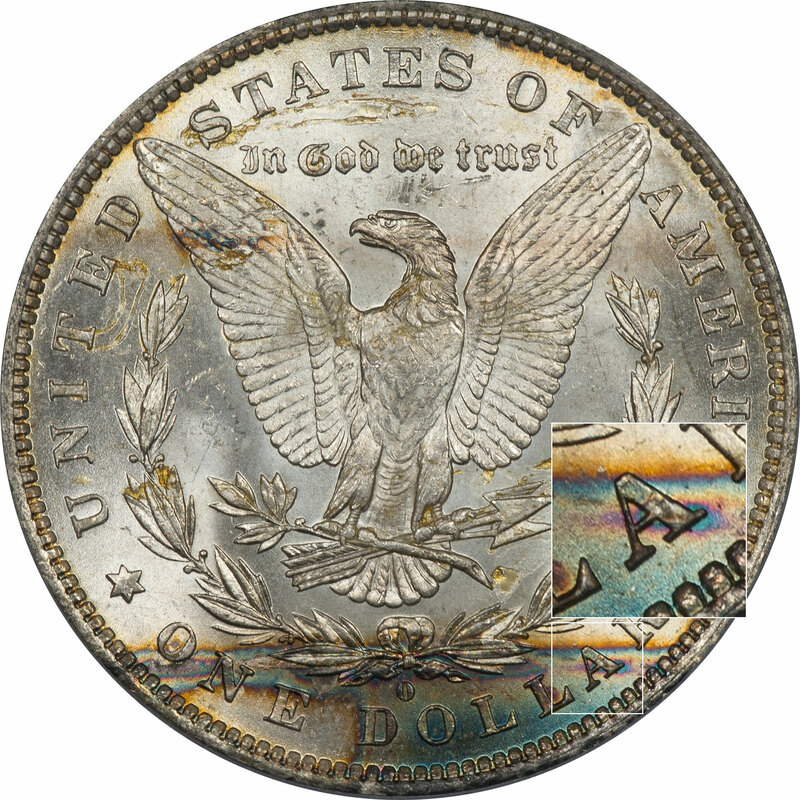 The obverse seems to have had more exposure and is in the third cycle with magenta blue and blue dominating the one region of spectrum. The dark golden areas near the rim appear to be orange, but also with a little moisture damage mixed in to give it a darker look.